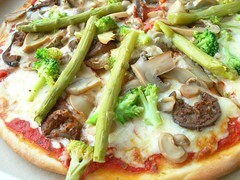 Vegetable Delight – marinated veggies – aspargus, portabello mushrooms, broccoli and regular mushrooms. From one of the best pizza places in Trinidad that’s not a big chain Rik’s Pizza (not that I have tried them all!). The owner is Belgian and opened up a pizza place in Chaguanas, following sound advice to make everything halaal for good business in Central Trinidad. What makes this good pizza for me is the toppings (I do admit the crust could be better, but it’s not bad). They’re fresh and interesting and taste really good. And it’s different from the ordinary. The 1st favourite is the Moonlight – spicy beef bolognese and peppers. The Vegetable Delight is sometimes my 2nd favourite. and various spicy sausage pizzas – chicken and beef (yet to try the lamb). The lasagne isn’t so great, but not terrible. This entry was written by Chennette and posted on April 13, 2006 at 8:10 pm and filed under food, photos, Trinidad and Tobago. Bookmark the permalink. Follow any comments here with the RSS feed for this post. Post a comment or leave a trackback: Trackback URL. Hi, you have a great blog here, why don’t you keep updating it? Thanks for the comment – Despite the date, I am updating I am essentially creating a blog from pre-exisiting pictures etc and gradually reaching present day – the blog is really only a couple weeks old. Don’t worry, my sister thinks I am crazy too. lol, ok. Well I’m just making sure. You take some really good pictures also. Hopefully I can be half as good when I finally get my own digital camera. I hope you don’t mind if I blogroll you? I never said you were crazy or that I thought so with regards to your blog. I just can’t keep track of your entries very well until you’re up to date. Well, they’re my photos, which I am posting as a record of where I have eaten with a critique. I don’t claim to own the store or to have made the pizzas. Ah – thanks for the visit and the comment. Rik’s is in Centre Pointe Mall in Chaguanas, on Ramsaran Street, next to Mid Centre Mall. You need better directions? Oh my! That Vegetable Delight looks scrumptious! Just looking at the pictures is giving me serious taste memories. I really liked that vegetable and those meat toppings. Let’s be adventurous this holiday. Let’s make proper seasoned meat toppings. He moved many years ago, to some where on the Southern Main Road, Charlieville I think? But not there anymore.